As we gather to give thanks this year, I’m thankful that I’m celebrating Thanksgiving with teens. Truly, I thought about it recently and Thanksgiving is a holiday that, in my opinion, only gets better as the kids get older. Well, take sleep, for instance. No one pokes me in the eyeball at 5:30 am to watch Caillou or play Candyland. Teenagers can sleep! And I’m also pretty sure that this year my son, 15, won’t ONLY eat Hawaiian rolls or brown sugar for the Thanksgiving meal. He’s growing up and his palate is oh-so-sophisticated. 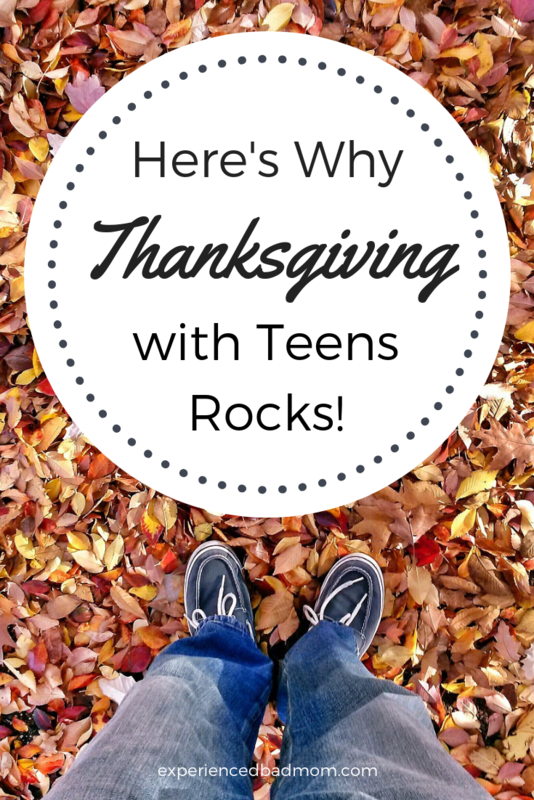 I’ve got the full list of reasons why I’m giving thanks for my teenagers this Thanksgiving over on Your Teen. I’d be thankful (see what I did there?) if you check out! Can you relate? Do you like Thanksgiving better now that your kids are older? I’m loving your latest posts over at Your Teen Katy! Way to go, friend!